Ginkgo biloba is an ancient plant whose constituents have numerous beneficial effects on nerve tissue and circulation. Support by Ginkgo biloba extract (GBE) for normal brain function is based on neuroprotective effects against agents that can promote neuronal degeneration as well as regulating effects on neuro-transmitters. Research also shows GBE to have profound effects on circulation through inhibition of platelet activating factor (PAF) and other mediators of blood viscosity. GBE has been demonstrated to promote cerebrovascular and peripheral vascular circulation, enhancing blood flow, glucose delivery and oxygenation throughout the body, especially to the brain and nerve cells. 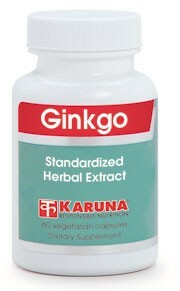 Karuna's Ginkgo biloba extract (GBE) is standardized identically to specifications for extracts used in clinical trials. Ginkgo contains two important constituent groups - the ginkgo flavone glycosides and the terpene lactones. Ginkgo biloba's flavone glycosides act as potent free radical scavengers within the cardiovascular and central nervous systems (Life Sci 2000;67: 1389-96; Phytomedicine 1998;5:425-34). Ginkgo is well-known for its neuro-protective properties (Zeitschrift Phytother 1994;15:92-6) and its support of normal cerebral functions such as memory (Arch Neurol 1998;55:1409-15. Fortschr Neurol Psychiatr 2009;77:494-506; Pharmacopsychiatry 2010;43:86-91; Phytomedicine 2011;18:1202-7). Ginkgo biloba inhibits platelet activating factor (PAF) which, in excess, can contribute to imbalances in leukocyte activity, bronchial function, and circulatory supply to body tissues (Thromb Res 2002;108: 151-60; Arzneimittelforschung 1990;40:589-93). Ginkgo promotes normal circulation (Fortschr Med 1993;111 (10):170-2) and can increase pain-free walking ability in older patients with impaired circulation (Arzneimittelforschung 1992;42:428-36; Int J Clin Pharmacol Ther 2004;42:63-72).